Unable to connect to ANY SITES with latest update FPR6.1! I have tried everything to get your new Parity Release FPR6.1 to work on my Mac G4 though all the other releases have worked just fine. I definitely have the right version of this release for my Mac, I haven't changed any of my Network Settings, and I have no add-ons but this new version cannot connect to - or load - anything. If the Update corrects an urgent Security issue I definitely need and want it but nothing I do can make it work. I'm attaching screenshots related to this and hope someone can help me resolve this soon. If it was only https sites you can't connect to I'd say, check your system clock. But since www.tenfourfox.com is also affected, I'm not sure what to say. Which TFF version did you use to post this? If previous versions work, first I'd try and re-download the FPR6.1 version from Sourceforge. Also check the firewall settings and make sure apps like Little Snitch don't interfere. I test the builds on both the internal and external networks, and I can't reproduce this now or previously. 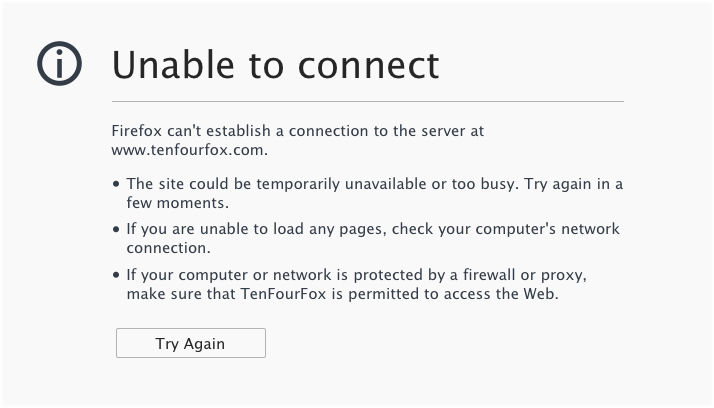 I checked and tenfourfox.com is properly redirecting, so it's not a server issue on this end. Can't get into the amtrak web site withthe recent ten four fox bro3wser app and the one before it -- FPR 6 and FPR6.1. The owner of www.amtrak.com has configured their website improperly. To protect your information from being stolen, Firefox has not connected to this website. "Allow" Parity 6.1 in Little Snitch. And finally, it's working! deserve props for developing - and maintaining - this overall fine browser. 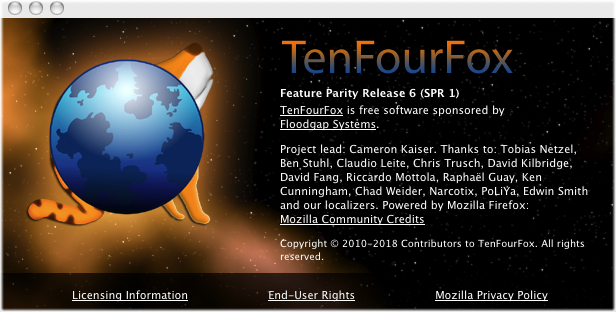 TenFourFox does support add-ons, just not plug-ins (they aren't the same). Note that add-ons are supported "best effort" only, i.e., we can't test the entire gamut of them and we can't guarantee that one that worked with Firefox 45 will work with TenFourFox, though we won't do anything to intentionally disable them unless it's necessary. If the built-in user-agent switcher is not sufficient for your purposes, try re-enabling that add-on. I'm not convinced it's actually the cause, though anything is possible. Thank you!! Can I assume that sometime down the road TenFourFox will be configured to provide that cipher support? Why I have these laptops -- they take a basic interpreter ("Chipmunk Basic") which I use to recode and run old Fortran mainframe programs and new spinoffs of such, and that gives me the willies when I think back on how I used put those to use on the CDC 7600 and Cray-1. Steve, yes, I'm looking at a possible fix. I'm glad the browser otherwise works for you. If the fix I have in mind does allow access, it will be deployed in FPR7 (scheduled for May 5 or 6 parallel with Firefox 60). If you need this sooner, there will be a beta in a couple weeks. Paulie, I'm pretty certain the cause for your original problem was Little Snitch, and that you'll be able to log into your sites with FPR 6.1 with User Agent Switcher now that you've allowed FPR 6.1. Muchas gracias. I'm not suffering too badly right now -- my wife's granddaughter upgraded to a Macbook Air thanks to "Nana" continuing two decades of spoiling her, and I "inherited" her MacBook Pro with the Sierra OS. I can log into AMTRAK with it until you release FPR7. I would be pleased to beta test FPR7 on the AMTRAK access issue if you provide me with it. You might be amused to hear the the only problem I have with Sierra is cutting its options back to get the "Tiger-Leopard" 10.4 - 10.5 feel I'm used to. Ten Four Fox Feature Parity Release 7 works! I can log into the AMTRAK.com site now and set things up. I have not yet completed a reservation and actually gotten train tickets, as I'm not quite ready for that yet, but so far it looks good. The only thing now different is that AMTRAK totally revamped its site and its new version is pretty sluggish on my G4 PPC compared to the previous version they had going (before all this hoo-ha when they reinvented the site and bumped Ten Four Fox FPR6 (and Opera) in doing so). I'll continue to run with FPR7 on my G4 10.5.8 PPC and let you know of any issues. I'll also load it on my older Macbook PPC running OS 10.4 and see how that works there too. FPR7 beta running good so far -- normal usage.